Sunday morning saw various folks rise from the dead and gather for breakfast – another mighty catering WIN from Google’s chefs – Full English if you so wished, fruit and cereals for those of a more delicate constitution. It took a while for the brain cells to get going (copious amounts of coffee and fresh orange juice helped), so the first session I sat in on was the second of the day. The ideas of the web – a bit of history about the technology? It was a very thought-provoking session, and a few of us continued in well into the break. Then coffee called, so I ended up missing another session! Oh well. Vicky has self-published several fiction books and gave us some tips on the tools she uses for writing and typesetting (Word on Window), Lyx (for Ubuntu). Then she gave us a quick tour round the Lulu self publishing site. It is possible to get a book with ISBN – or self-promote, distribute, sell via web etc. In general, covers need to be 300dpi TIFF while text is usually send as a PDF (fonts only embedded where licencing is not an issue). CB gave a great presentation on the proposals for BarCampRhine, which basically involves BarCamp on a ship sailing from Basel (Switzerland) to Rotterdam (Netherlands), with static BarCamps in cities along the way, such as Basel, Karlsrühe, Mannheim, Köln, Strasbourg, and Rotterdam. The idea was originally suggested by Frenchman Sacha Lemaire and has been presented at various BarCamps in Europe since then. Q. 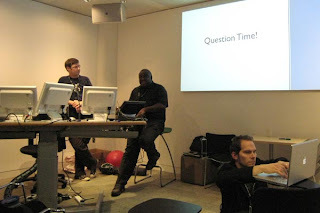 How long have you spent working on BarCamp? A. Ian – Backstage are a sponsor, some time can be claimed from work time – at least a week’s time. Q. How much personal risk did you need to take? A. Ian – does not put himself at risk, sponsors take the can. Oliver, some risk. Q. How many others helped out? A. Oliver 12-15. Ian 2 Googles. A. Most people in room. Alistair organising one in Tyneside. Previous experience to give it a go. Q. Norm – what would you do for a first step? A. Get people to help – people who are passionate about it. Q. How would you find those people? A. Don’t know (Norm). Ian – says its a lot easier to go it along to begin with. Oliver – don’t need to look for passionate people – they will ask you if they can help. 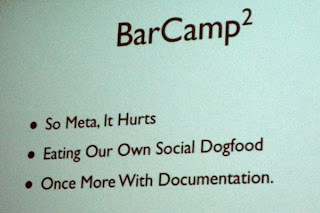 Ryan’s suggested BarCamp2 – a BarCamp about organising a BarCamp. This seemed to go down well, and hopefully something concrete will begin to take shape soon. Keep in touch with the people you meet up with. Twitter – finding out what people are doing now. Then we were all encouraged to exchange cards with folks in the room who didn’t already have ours. As the sessions came to a close, everyone reconvened in the main canteen for the farewell closing speeches. 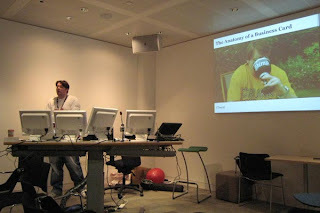 I think everyone agreed it was a spectacularly successful BarCamp, certainly the best I’ve been to. The Highs? – brilliant wifi, food to die for, lots of geek toys to play with and plenty of friends old and new to hang out with, winning at Werewolf! This entry was posted in barCamps, geekery, internationalisation and tagged BarCamp, barcampbarcamp, BarCampLondon3, BarCampRhine, barcampsquared, cbgreenwood, dan dixon, dan webb, geeks, google, pubstandards, ross bruniges, ryan alexander, sebastian grünwaldt, vicky lamburn. Bookmark the permalink. 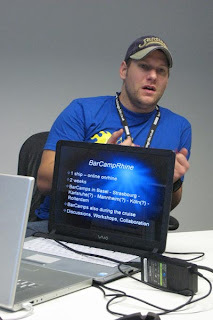 Thanks for talking about BarCampRhine. In fact, the initiator of the project is Philippe Schoen, who is also the initiator of the BarCampAlsace, (BarCamps in Strasbourg, France). I’m more an enthousiastic follower. 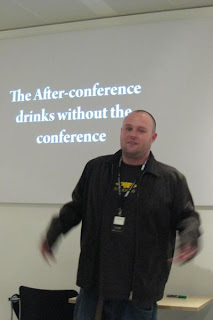 Thanks for the info – I have set up a Yahoo pipe feed for the BarCampRhine wiki page (I don’t want to get updates from every page but just this one) – perhaps I should post the address for other folks to see too. do you still have the Pipes link?